With my wife, Lorraine, I had the privilege of touring Nova Scotia in September 2007. Like many places today, Nova Scotia has excellent provincial parks and provides much information to help tourists find their way and learn about the country. I picked up a collection of tourist brochures about places I’d not heard of before, including: Porters Lake, Amherst Shore, Cape Chignecto, Smileys and Taylor Head. It was great to have well presented information, including maps, trails, cultural heritage and contact details. Each brochure had a section about the natural history of the area, and that history was always presented in terms of geological evolution over millions of years. Yet, the detailed evidence presented in the brochure often pointed to things happening rapidly. In other words, the evidence does not support the idea of millions of years, if you know what to look for. Take the brochure about Taylor Head for example.1 The peninsula juts into the North Atlantic Ocean from the south coast of Nova Scotia, about 100 km (60 miles) north east of Halifax. Sand volcano in County Clare, Ireland. From a straightforward reading of the Bible we learn that God created this world supernaturally about 6,000 years ago and he judged it by a global Flood about 4,500 years ago. So by speaking of ages of 1,000 million years the brochure, funded by the government, makes it plain that the Bible cannot be accepted as written. So, while it does not mention the Bible specifically it clearly presents its information within a contradictory philosophy. It’s a clash of worldviews. The idea of millions of years comes from the assumption that geological processes in the past always happened slowly—that the processes of erosion and sedimentation were gradual, like we see happening with the rivers of the world today. It’s based on the assumption that you don’t accept the history of the Bible as read. 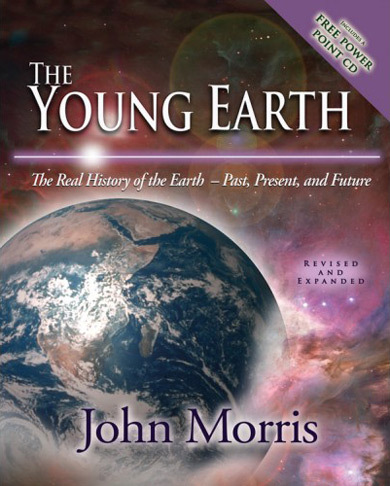 For the idea of millions of years to take hold, especially in the UK, it was necessary to eliminate any thought of past geological catastrophes. So for more than a hundred years in geological circles, from Charles Lyell in the 1830s to the 1960s, catastrophe was regarded as a vulgar word. But now that the idea of millions of years is firmly established, the opposition to catastrophic interpretations has eased somewhat. Overlying sediment slides across ocean floor rapidly, most likely as a density current. Water trapped within the sediment is pressurized as sediment settles. Water is expelled from localized points where it forms sand volcanoes. Where do we see great volumes of thick sediments being deposited in the middle of a continent today? We don’t. 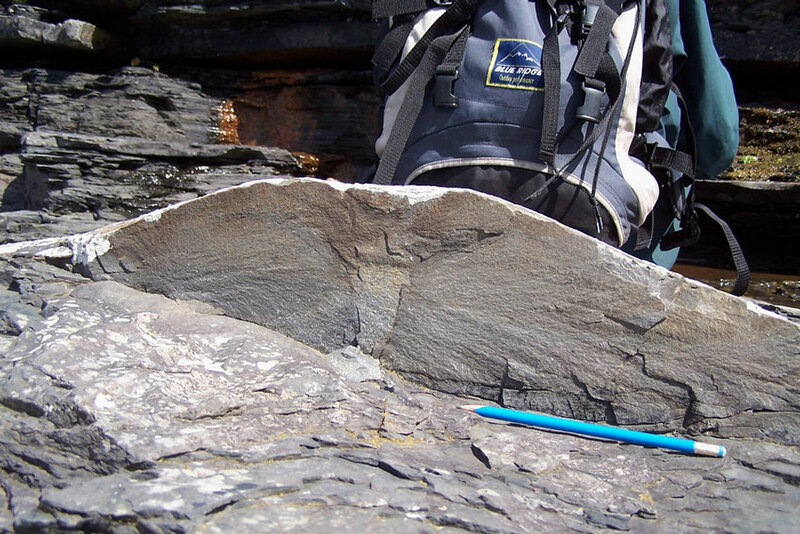 From the outset it looks like there was an unusual depositional environment in the past. And then we have these volcano shaped sand structures. These speak both of rapid sedimentation and rapid dewatering. The overlying sediments were deposited before the underlying sediments were consolidated or dewatered, and deposited quickly. As they settled the water escaped in jets through the soft sediment and carried sand to the surface, depositing it as a volcano. In other words, both the underlying and overlying sediments were deposited quickly, and there was not much time between the two. 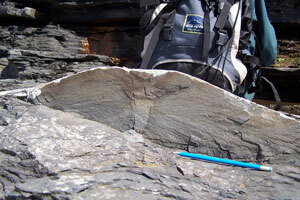 Flute marks are produced when sediment-laden currents scour the ocean bottom, gouging out scoop-shaped depressions. 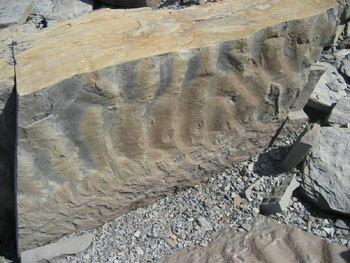 Ripple marks also point to fast-flowing water (which produced the ripples), and to rapid covering with more sediment (preventing the ripples eroding away). Note: ‘strong ocean currents’, ‘large volumes of sediment’ and ‘rapidly’. As we mentioned before, what is this ocean doing in the middle of the supercontinent? Then, this evidence speaks of anything but slow and gradual processes. The sediments extend for many hundreds of kilometers laterally,2 so we are speaking of strong ocean currents covering a huge area. And we have huge volumes of sediment which means there must have been much water to transport it and it was deposited rapidly. But there are a few important features that the brochure does not explain. First the beds are thick, which is further confirmation that the volume of sediment was colossal, and that it was dumped very quickly. Second, the beds are made of greywacke, an old term that refers to sandstone consisting of angular particles of quartz feldspar and rock fragments embedded in a matrix of clay. In other words, the sediment is poorly sorted, suggesting it was deposited so quickly that it did not have time to sort into different sizes, or to wear the individual particles into a rounded shape. And finally, for the sedimentary layers to accumulate to the huge depths that we see, the water level would have had to be continually increasing. Geologists call it accommodation. The sediment won’t deposit in an area unless there is room for it to settle. Otherwise it will simply be carried through the area to a place where the water is deeper and where there is room for the sediment to be deposited and left undisturbed. So, although the brochure speaks of millions of years the evidence is of fast flowing, extensive water currents carrying huge volumes of sediment, of a great depth of accumulation and rising water level. Ripple marks in fallen sandstone block, Joggins, NS. Can you see how, if you ignore the dates, the evidence is consistent with the biblical account of Noah’s Flood? In fact, it is the evolutionary geologists who have the time problem. The evidence speaks of rapid processes and these do not require the vast eons of time. 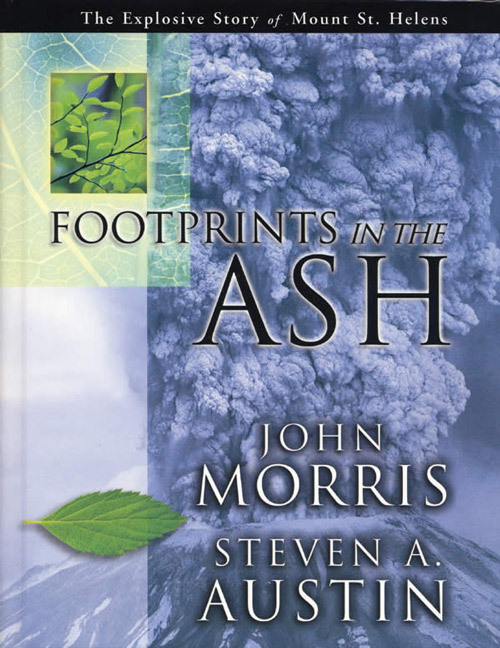 Evidence for geological catastrophe is so pervasive that there has been a return to catastrophic thinking in geological circles—neo-catastrophism. But where do the neo-catastrophists put the millions of years? They suggest that it belongs in the gaps between geological deposits, in those places where there is no geological evidence. In other words, the idea of millions of years comes from their philosophical bias, not from the evidence. For those who won’t believe the Bible, who have closed their minds against the possibility that it could be recording real history, no amount of geological evidence will change their thinking. No matter what is presented they will always invent a story to re-interpret it within the long-age paradigm. Taylor Head Provincial Park, Information Circular PKS-38, Department of Natural Resources, NS, 2007. Return to Text. They are part of the Goldenville Formation, which covers much of Nova Scotia: Donohoe, H.V. and White, C.E. (Co-chairpersons), Nova Scotia Geological Highway Map, Communications Nova Scotia and Atlantic Geoscience Society, Halifax, NS, 2005. Return to Text.